Isn't potato an odd choice? I guess I'll have to read the book to find out! Well the idea came from the book title, of course, But actually it's a useful word to use in an exercise of this kind, as it quickly brings to light vowel variations, glottal substitutions, stress vs syllable-timed rhythm, and various other things. The associated 'and this is how I say' of course adds further variables. 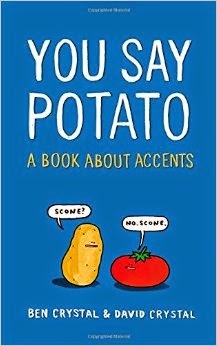 The common pronunciation of potato in the New York-New Jersey region is "Puh-TAY-duh, puh-TAY-duhz"; the self-conscious version is, "puh-TAY-dough, puh-TAY-doze." Those among us who still affect a Mid-Atlantic accent (an increasing minority, but still signicant enough to mention), say "puh-Tay-toe, puh-TAY-toes," with the same "o" you hear in London. No one, of course, EVER voices, "puh-TAH-toe," unless they're singing Cole Porter's song. Thanks, but I'd far rather hear real pronunciations on the yousaypotato.net site. The whole point is to hear what subtle differences exist, and these can't be captured by crude respellings. An addendum to my last point, as Marc was upset at my reference to 'crude respellings'. The word 'crude' here is actually a semi-technical term, often used with reference to all respelling transcriptions, as opposed to the more sophisticated transcriptions using a phonetic alphabet, and even the latter is crude compared with the kind of acoustic analysis which will eventually be done on the yousaypotato recordings. Yes, a number of people have recorded their alternatives on the map. Simon Armitage told us in an email that he never says 'potato' either: he says 'chips'. In the book, you seem to be bemoaning your son's pronunciation of 'schedule' as /skedule/ ie. the American way but in a subsequent sentence, you spell 'realise' with a 'z' ie. the American way. There's no escape, is there?! The book is very enjoyable and accessible and has given me some ideas for my sociolinguistics class. Thank you! Not bemoaning at all, in fact - fascinated surprise, more like. That 'z' spelling isn't American, though it took off there. You'll find it used by several British publishers - as well as in Shakespeare's First Folio! This is a FANTASTIC book! I couldn't put it down. I thoroughly enjoyed how many different sub-topics of language were covered within the book and have recommended it to people who are not necessarily interested in language/linguistics as a whole, but have a fascination with, say, invented languages such as Klingon or Na'vi. I recall that, many years ago, when I used to read "war stories" there was mention of an incident when a British RAF officer criticised an American serviceman for pronouncing skedule. "Where did you learn to speak in that abominable way?" "I am sorry, sir," was the response. "I guess I must have learnt at shool." I have just finished your book, it was a fun read and insightful. However, I am compelled to remind you that Dublin is the capital of the Republic of Ireland...I remind you because it was referred to as part of Britain directly and indirectly, at several points throughout the book. Also,(p. 228) Mary Coughlan is from Galway in the West of Ireland. 'Southern Ireland' isn't a place (anymore; it was a political name used between 1921–22). There some distinctive accents in the southern parts of the island (Cork/Kerry SW/ Wexford SW) but Mary Coughlan's accent is defined by her being from the Atlantic coast, gealtaigh region of Ireland. Several points? Just one, I think, when Ben slips Dublin in to his list of accents on p. 213. We should have picked that up. Otherwise, the Republic is clearly distinguished from Northern Ireland in the main descriptive section. We don't refer to 'southern Ireland' anywhere in the book. We refer to 'the south', at one place, which is admittedly vague, so thanks for the pointer about May Coughlan. is there a direct link to the page to record my potato? i can't find it on the macmillan page that yousaypotato.net redirects to. i'm a berkeley, california, usa native. Macmillan seem to have let the page lapse, which is shame, as there was a lot of interesting content on it. I’ll see if I can get them to transfer the page to my website.